A scientist might be able to answer any question pertaining to the magnetic fields, but actually how much information do we have about the Earth’s magnetic field. If we tend to change our focus from the Earth’s magnetic field, how much information do we have about other magnetic fields like subatomic or terrestrial. In March 2015, NASA is expected to be launching their Magnetospheric Multiscale Mission (MMS). The scientists have been putting in effort in this mission from past 10 years, mainly to get answers to some of the unbelievable questions pertaining to the Earth’s magnetic field. The mission consists of 4 satellites and these satellites are expected to get arranged in a Pyramid form. This pyramid form has been opted to create a first detailed three-dimensional map of a process called as magnetic reconnection. The magnetic reconnection is the phenomenon which is experienced directly as solar flares, geomagnetic storms, and even australis and aurora borealis. This mission is expected to be the extended version of the European Space Agency’s successful Cluster II Mission. In March 2015, NASA is planning to launch the MMS vehicles together as a stack in an Atlas V 421 rocket, rather than launching them in pairs. 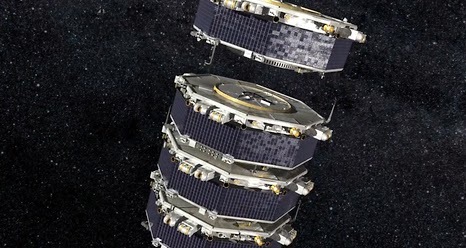 The picture of the satellites released by NASA shows that these vehicles push the size limit for the cross section of a craft which can be easily carried out in a rocket in an assembled form. On the similar concept, NASA has also been working on a separate project, called the ATHLETE robot, which resembles the outlook of MMS and also has the ability to pile multiple vehicles in the core of the rocket. Once these reach their desired destination, which is a highly elliptical orbit around Earth, these vehicles will separate from each other and form a pyramid keeping one craft at each vertex of the tetrahedron. Later on they will release the feelers. Scentists will be using the smaller probe separations (few kilometers) for exploring the actual reconnection processes and Large distances between each craft (Ranging up to 250 miles/400 kilometers) for the identification of the reconnection events. The day-side magnetopause and the magnetotai will be the places where the magnetic connection will be showcased and this will done through the optimization of the highly elliptical orbit of the formation around the Earth. The magnetopause is the place where the pressure from the planet’s magnetic field and the solar wind and are equal, on the other hand, the magnetotail spreads to great distances from the originating planet due to the magnetosphere (pressure from the solar wind). The Magnetic reconnection happens in the thin layers where there is a high concentration of magnetic and mechanical energy. In order to create a fusion, it is important to understand the magnetic reconnection. This will help in understanding the magnetic confinement of the materials which scientists are looking towards fusing. This mission has be launched to understand the magnetic field of the earth and how the core temperature of the earth affects the same.